Our plan for camping in an orchard didn’t turn out well. My friend planned for a day trip to Kuala Selangor last Saturday. Joined altogether by three families: 6 adults and 5 children. 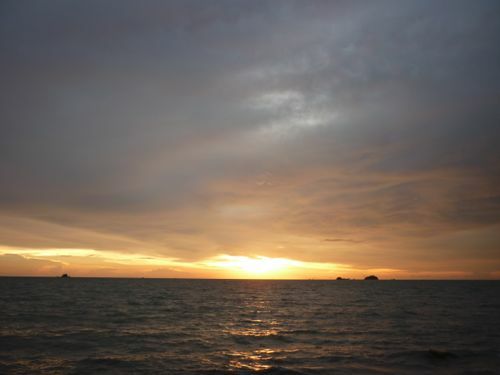 Kuala Selangor is famous for Bukit Melawati, fireflies, and seafood. We only started our trip to Kuala Selangor at noon. And this was partly to coincide with the lunch plan in Ijok – where it’s famous for Beggar’s Chicken. Overall it was a good trip but one thing stood out like a sore thumb and it was totally unexpected of. Read on and find out about the unscrupulous operator. Ijok is a small town located between Sungai Buloh and Kuala Selangor (or between Rawang and Kuala Selangor if you want to put it this way). In one of the houses near an oil palm plantation, lies the famous restaurant. It’s hidden from the main road, so watch out for those road signs. If you plan to drop by, please make reservation first. No walk-in customers will be entertained. 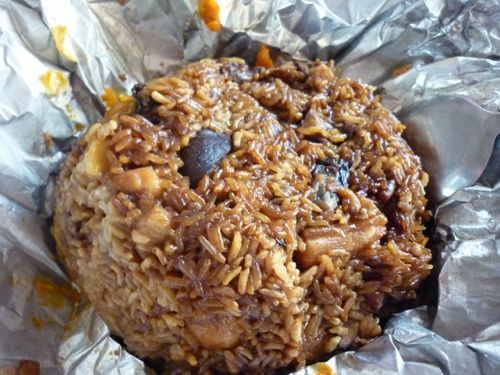 For a group of our size, we ordered beggar’s chicken (叫化鸡) and glutinous rice (八宝饭) over the phone. When we reached, we added stir-friend cos lettuce (yau mak) and tofu. Surprisingly, we were told we couldn’t place order at the restaurant but we did. 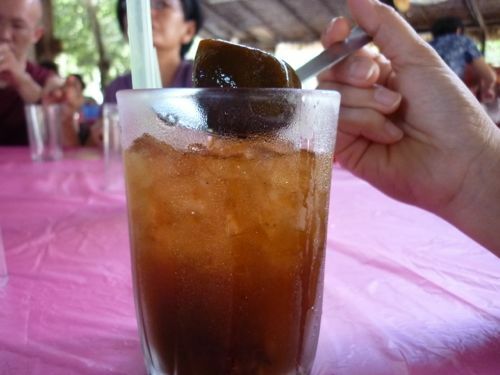 Another must try when you are there is its signature, home-made kumquat (金桔) drink. Kamquat drink – super refreshing! Remember not to over-order as the servings can turn out to be humongous. I personally find the beggar’s chicken here is better than the one in Bukit Jugra. 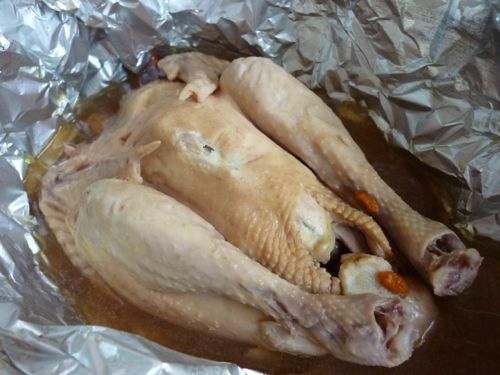 It has stronger taste of Chinese herbs and the chicken is not as dried. But the glutinous rice which contains mushroom and salted egg yokes is just average. The bill came as RM150. After we were there for some time, the restaurant is packed with customers. I was told by my friend who did the booking the operator is not very friendly and you can get a sense of arrogance when you call them. The food is not super fantastic but if you have not tried it, give it a shot. Make sure your expectations are right. Business Hours: Open on every Wednesday, Saturday, Sunday, and Public Holidays. 1 pm onwards. As if we had had not enough from all things beggar, we headed to a cendol stall right after our heavy lunch. It’s only about 10 minutes’ drive from Ijok, towards Kuala Selangor. What else to ask for when you can have a cool, smooth cendol for dessert on a hot Saturday afternoon. By looking at the queue at Cendol Bakar, one can conclude that the cendol must be a killer. Standard cendol is RM2. 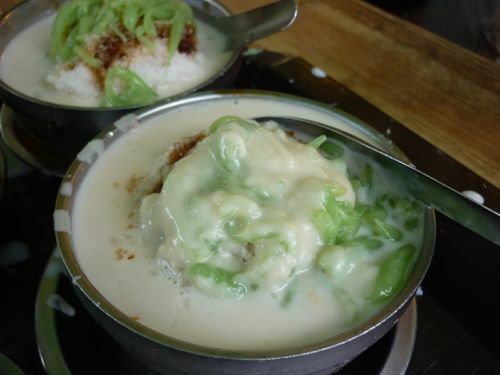 What is special about Cendol Bakar is it uses brown sugar instead of palm sugar. Hence, it’s not so sweet. But I still prefer palm sugar in my cendol as it’s more fragrant and authentic! Guess what! 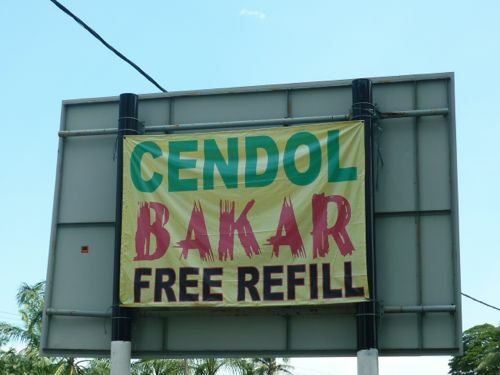 For the first time in my entire life, I saw free refills for cendol at Cendol Bakar. I couldn’t believe what I saw. To prove it, I asked for a refill after I emptied my bowl. As promised, they granted me another bowl without questions. Kudos to them for being the pioneer of offering refills. 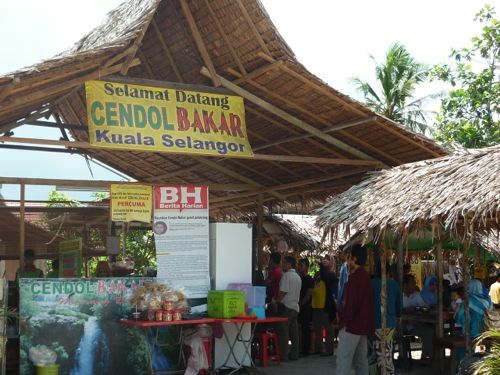 Cendol Bakar used to have drive through service. But it was stopped due to some unknown reasons. Besides cendol, there are other foodstalls selling various types of Malay food. Bukit Melawati (also spelt as Bukit Malawati) is one of the popular tourist destinations in Kuala Selangor. 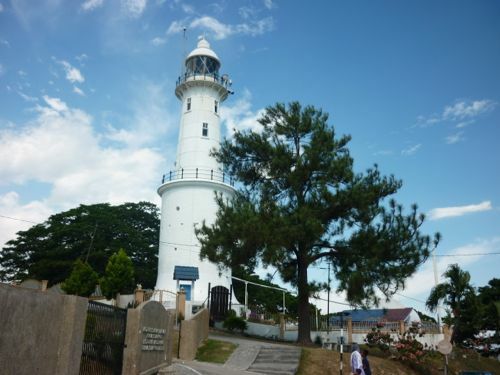 It’s a hill overlooking the Strait of Malacca and it is rich in history. The first thing we did was to line up for tram tickets (RM5 adults, RM3 for children above 3). The booth is located at the entrance of Bukit Melawati. The ride includes one round trip up to the hill and Freshwater Fish Farm nearby and back to the ticket booth. The tram turned out to be one of the highlights for children. They were excited climbing up and down the tram. When you reach the top, one thing you can’t miss is monkeys. There are two species of monkeys: black and brown. I was told by the peddler there the black ones are more friendly. It’s not advisable but if you have food in your hand, the monkeys will gather around you like you are being attacked by a group of gangsters. And monkeys were the second highlight of Bukit Melawati for children. 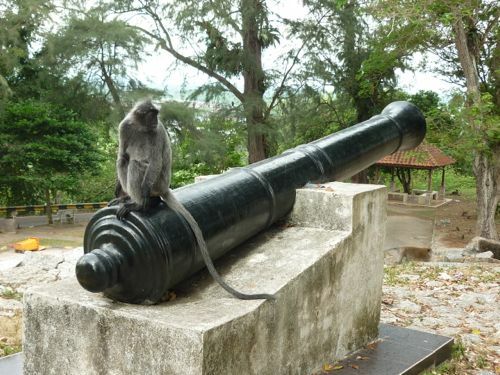 Bukit Melawati used to be a fort during the Selangor Sultanate in the 18th century against the Dutch. Hence, cannons are a common sight here. We visited the Historical Museum of Kuala Selangor (Muzium Sejarah Kuala Selangor) which focuses on the history and artifacts of Kuala Selangor. Entrance is free. Another scenic site for taking pictures is none other than the lighthouse. It’s even more tantalizing when the lighthouse is coupled with nice, blue sky as the backdrop. We didn’t have time to visit the Poisoned Well (Perigi Bearcun), and Seven Wells. 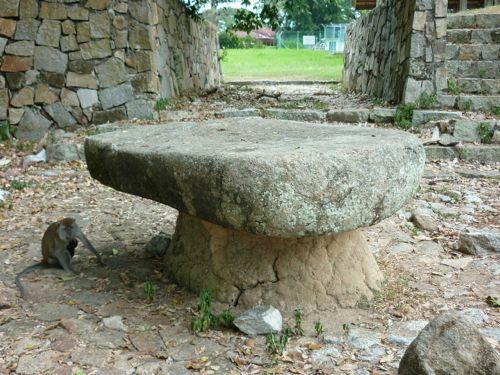 However, we managed to check out Batu Hampar which is located within a walking distance from the Historical Museum. The boulder was used to behead the traitors in the old days. We took the tram down and it went straight to Freshwater Farm nearby. This is not on our itinerary. But I remembered there’s a shop which is famous for it’s pau (Chinese steamed buns). My friend did a quick search on the Internet and found Shin Lok. Just to make sure that it still had some before we went, we made a call to the eatery. 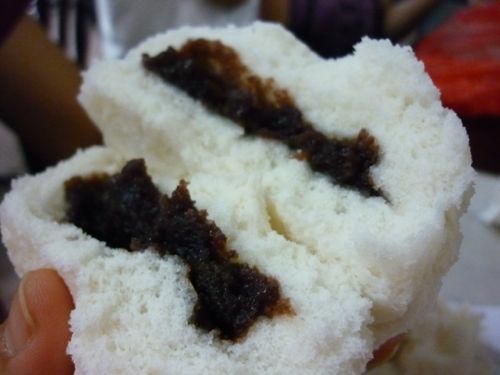 Lucky for us, there were still some tau sar pau (red bean paste buns) and peanut pau available. When we reached (about 20 minutes’ drive from Bukit Melawati, southbound), the coffee shop was about to close and it was about 6 pm then. But we asked for permission to dine in and it was okayed by the boss. A very friendly chap indeed! We ordered everything that there was to order. 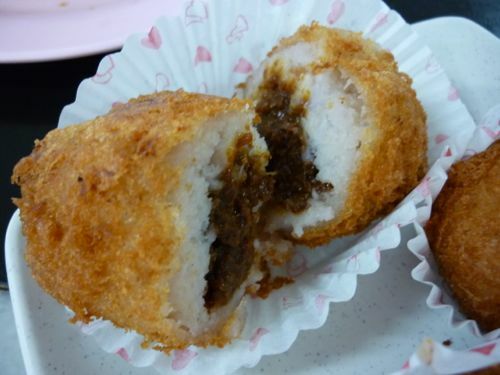 We tried its signature taro dumpling (wu kok 芋角), curry puff. Shin Lok is famous for it’s vegetable pau but sold out. We managed to try out its tau sar pau (RM1.30) and peanut pau. They were awesome. I like the dough’s texture and the tau sar was smooth and savory. Yum, yum. Is it me or what? The coffee turned out to be excellent too! We noticed there was a pile of kaya (coconut jam) on a tray. What attracted our attention was it was made of duck eggs instead of the usual chicken eggs. My friend who has obviously the adventurous personality type asked for a free sampling. To my surprise, the friendly owner obliged. That was our mistake. After trying out the duck-egg kaya, we ended up buying 5. 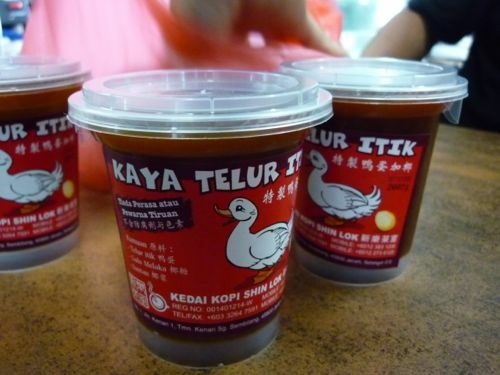 Despite duck eggs are more expensive, the kaya is only retailed at RM2.50 each. Though I find the kaya too sweet, but since it’s made of duck eggs and palm sugar, it has a nicer flavor than the conventional kaya sold elsewhere. After finishing their tau sar pau inventory, we packed 4 chicken pau home for breakfast the next morning. I like this coffee shop so much I even suggested to my wife to come here for breakfast one day – all the way from home! Shin Lok is facing the main road. 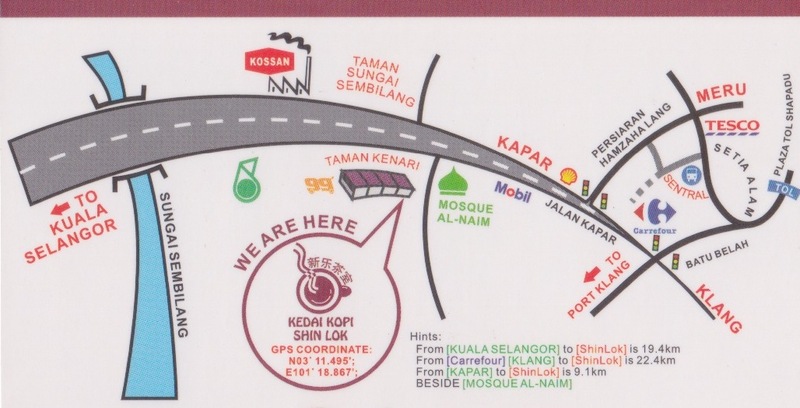 If you come from Kapar, Klang, it takes about 15 minutes (9 km) – before reaching Kuala Selangor town. Business hours: 7 am to 7 pm. When we went there, the shop was closing at 6 pm. Just less than one kilometer from Shin Lok, heading Kuala Selangor town, is a turning that leads to the ever crowded beach. I didn’t expect the small beach to be so packed with people and activities. 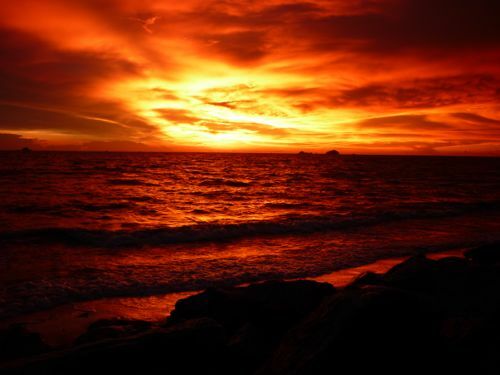 It’s called Pantai Remis and don’t be mistaken that this is not the town in Perak – which is more popular. Besides beach goers, there are stalls (selling foodstuff, kites, and all) lining up the streets. The beach is not a beach so to speak as there are boulders circumventing the coastline. One can still find a spot or two sandy beaches there. The kids were thrilled as they could fly the kites that took along for the trip. Some anglers were seen fishing at the seaside but the catch was not exciting. When you are there, be careful of the traffic as the place is cramped and pedestrians and cars are not segregated properly. We took time to enjoy the breeze and views of the Strait of Malacca. 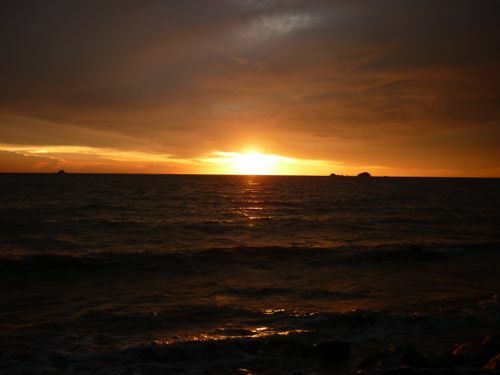 One exciting moment that we didn’t expect as we chatted away was the awesome sunset view of Pantai Remis. We quickly snapped every second of the fast disappearing but spectacular view. 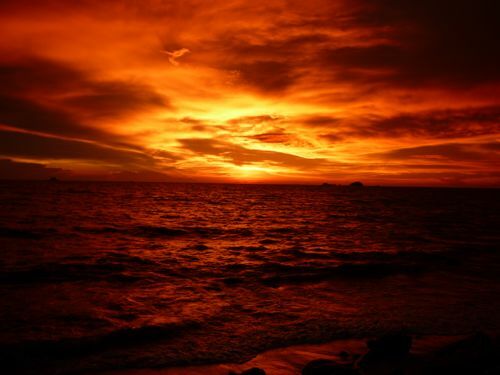 Pantai Remis is surely a place to go for sunset. Of all the items on our list, this is a huge let down. This is the second attempt for us to bring the kids to witness the wonder of nature. The first visit was almost 3 years ago but we didn’t make it due to heavy rain. Shockingly enough, we didn’t make it this time either. This time it was due to the greed of the resort operator. We were there at the ticketing booth and were told to hold on. Excuse given: low tides. But soon we realized a few bus loads of foreign visitors came and were given tickets and admitted to the jetty straight away. Only then did we realize, walk-in customers are discriminated (both local and foreign) and tickets were “reserved” for group tourists only. We enquired further and were advised to book online before going. My friend who did try to book online before the trip but the system failed to accept bookings. And no phone bookings are allowed for normal visitors like us. However tour guides are allowed to do so. Double-standard to the max! We came home empty-handed again without seeing the fireflies. I told myself I wound never come to this firefly park anymore. We were there for one hour and we were not allowed to buy tickets. The pain was to watch those who came later than us making a beeline for the jetty. We could do nothing but watched in awe a classic case of discrimination unfolding before our very own eyes. WARNING: I don’t recommend this firefly sighting spot due to their unprofessional treatment. Go there at your own risk. You might run a risk of being “barred” from getting entrance tickets. TIP: If seeing fireflies is something you must do, you can go to Kampung Kuantan (more humble and less commercialized). Or a new operator (slightly more expensive but spare yourself from the double-standard drama) with no frills and less waiting time which is located at Pasir Penambang. Just ask around at the seafood restaurants and they will be able to point you to the right direction. Before we went home after a long trip, we had a late dinnner in Pasir Penambang. We dined at Restoran Makanan Laut Jeti.